One of the hardest things for Premier to do, it seems, is build a less-than-premium pontoon. 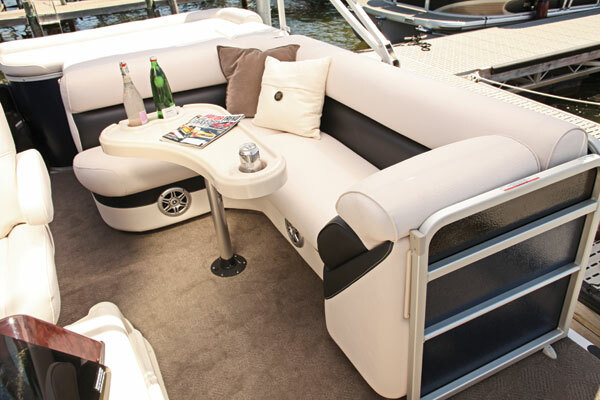 What started as the entry-level SunSation upgraded to the SunSation LTD, which morphed into the Solaris line, which Premier says are its mid-level pontoons. But for many other builders, the level of sophistication and comfort of the Solaris 235 RE TT would be top-of-the-mark material. Perhaps influenced by the negative connotations of the word “straight,” which can mean a boring, in-the-box person, Premier created the Solaris 235 with few straight lines in its styling. 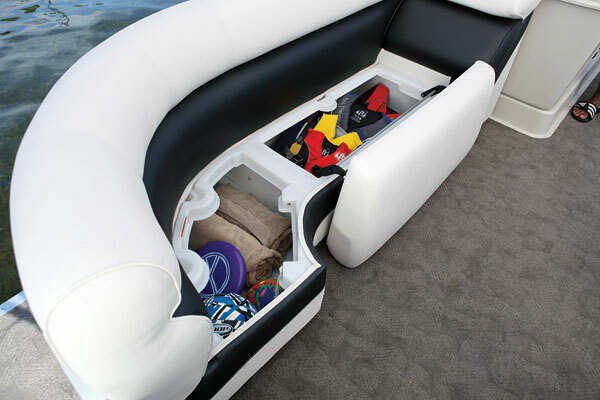 Curves abound, from the D-rails that swoop, to the 11-foot Evolution Bimini top, which has elegantly bowed support rails. And it’s not just about style. Personal comfort is also a major theme, as demonstrated by the twin Helmsman chairs in the bow on the port side — chairs that Premier builds in-house. These are the same comfortable thrones that are found at the helm, and the attention to detail is evident in little things, such as the fact that they recline but the armrests remain level. 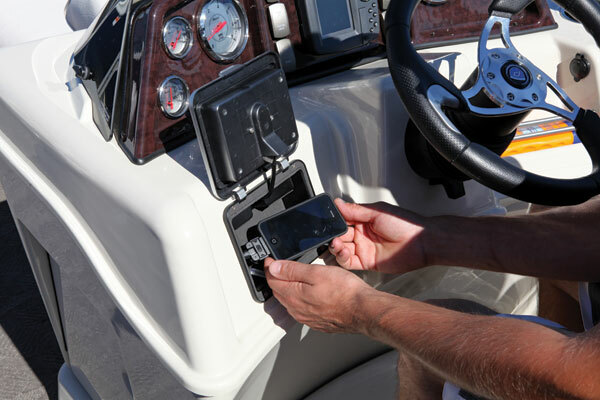 The all-new Eclipse II helm station is an upscale standard package with features such as the Hawk wheel, carbon-fiber gauges and a Humminbird 385ci GPS/fishfinder set into the angular burl-wood dash. Our test boat is equipped with the Command View helm, which is raised to provide better visibility over passengers’ heads in front. Too bad you can’t take it to the stadium to counter that weirdo wearing the rainbow wig. 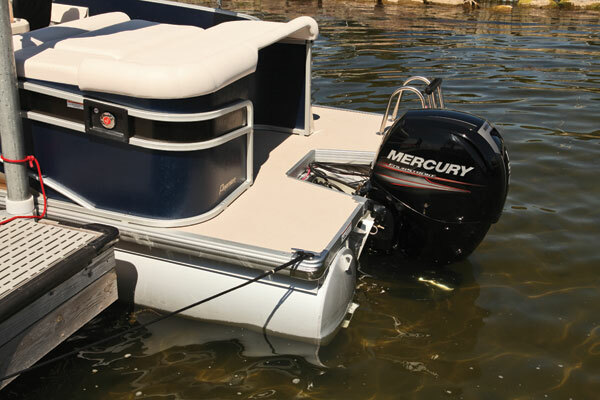 Powering the Solaris 235 is Mercury’s newest outboard, the 150 FourStroke. Unlike the Verado line of Mercury four-strokes, the new 150 isn’t supercharged and has a mechanical shift control, which makes it less complicated and more budget-friendly. It uses a large, 3L block, which is even bigger than the 2.6L powerhead in Mercury’s 350 hp Verado SCi. This allows it to provide power without strain and is a really good match for the triple-tube Solaris 235. Premier proves there is more than one way to float your boat with a number of tube configurations to suit your performance needs, as well as your budget. The ultimate setup is the 36” PTX, which gives you a giant U-shaped center log that has a flat planing surface for incredible lift. 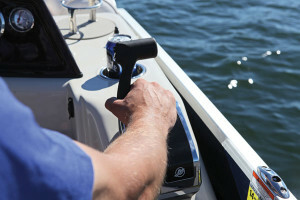 The 25-inch outer tubes have lifting strakes on the inside only for additional lift, and they don’t inhibit the boat’s incredible turning ability. A Solaris 235 with this setup has a max horsepower rating of 225. A less expensive version of the PTX Package gives you a 30-inch center log and allows you to put up to a 200 hp outboard on the transom. Even less expensive is the triple 25-inch-tube package without PTX technology, which is the package our test boat sports. Thanks to its lifting strakes and the max power for this rig, the 235 has nice out-of-the-hole performance, getting on plane in 3 seconds. The Merc’s strong mid-range power band took us to 25 mph in only 5.1 seconds, and we topped out at 34.2 mph. When equipped with the 36” PTX logs, the Solaris 235 drives like a well-designed sportboat, using the large center tube as a pivot point to lean in hard enough in corners to lift the outer log clear of the water. With our triple 25-inch-tube setup, cornering is flatter. On turns to port, there was a bit of inward lean, but when cranking it hard to starboard there was a bit of outside lean, because of prop torque. While the Solaris 235 doesn’t match the handling of its more expensive PTX counterparts, it stills hooks up nicely, and doing a 180 to pick up a downed skier won’t be a problem. Having triple tubes provides the buoyancy to be able to trim the sharp, beveled nosecones out of the water, even with three people lounging on the bow. 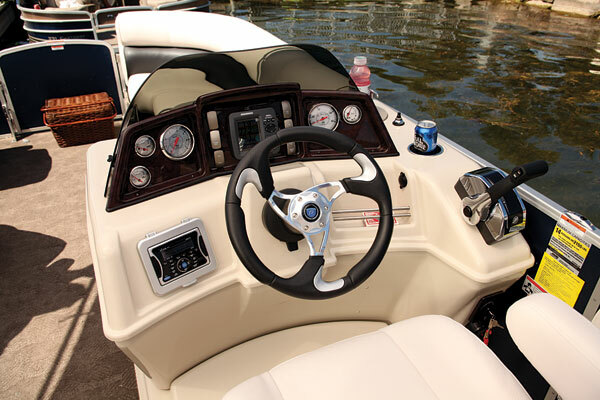 The Solaris 235 is well designed to handle anything you might want to do out on the water. Although Premier makes dedicated fishing models, such as the Alante 231, the Solaris 235 can accommodate casual anglers thanks to the twin Helmsman chairs in the bow and the extended rear platform, which can be used as a casting station. Adding an optional ski tow bar makes watersports possible, and the rear deck has plenty of room to boot up or hang out. Reboarding after a set is easy, with a swimming pool-style boarding ladder, and thanks to the generous double-wide sunpad, you can dry off under the sun. But entertaining or relaxing on the Solaris 235 is one of its strengths, with comfortable Signature by Premier couches with laybacks that have the perfect reclining angle. 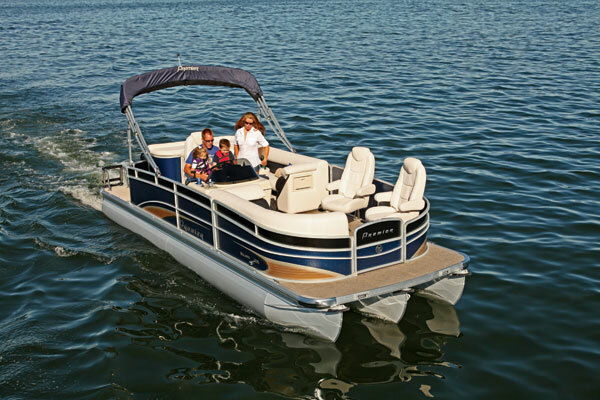 Premier offers an incredible number of options, which allows you to make the Solaris 235 your own pontoon. There are seven different flooring choices, from Teak to SeaGrass, and you have a wide variety of color combinations to choose from. It would be difficult not to select one of the PTX tube packages, although the triple 25-inch-log setup worked well. The only configuration I would avoid is the twin-tube model, only because with the twin Helmsman seats and the forward-facing recliner lounge in the bow, you will always have a full house sitting up front, which could cause the boat to plow a bit. And with a maximum power rating of 125 hp — which really means getting a 115 if you want a four-stroke — your watersports options will be limited on the twin-tube model. Premier offers a stereo upgrade that includes a Kicker subwoofer and premium Alpine speakers. 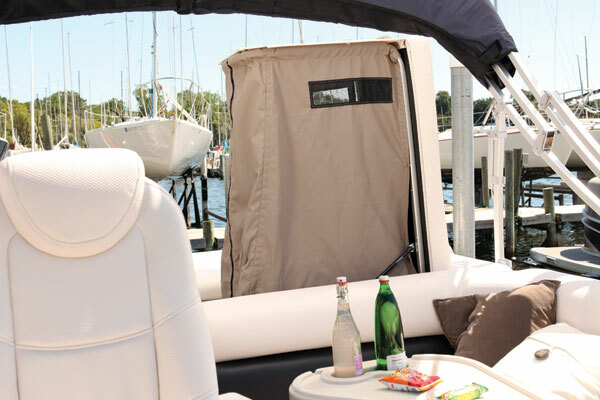 If you really want to take the Solaris 235 deep into the cool zone, equipping it with a power Bimini and Sea Legs, which raises the hull out of the water on four legs, will definitely create some wow factor. The only thing we need to make our pontoon complete is a grill for the burgers and brats. We do our boating on the beautiful Upper Chain of Lakes in Michigan and had an 18-foot bowrider, but it was too small to invite more than two couples to ride along. I did a lot of research and chose the Premier Solaris 235, which had everything we were looking for: sportboat handling with the 36” PTX Package, a powerful Evinrude 225 H.O. and enough room to take 10 people out in comfort. 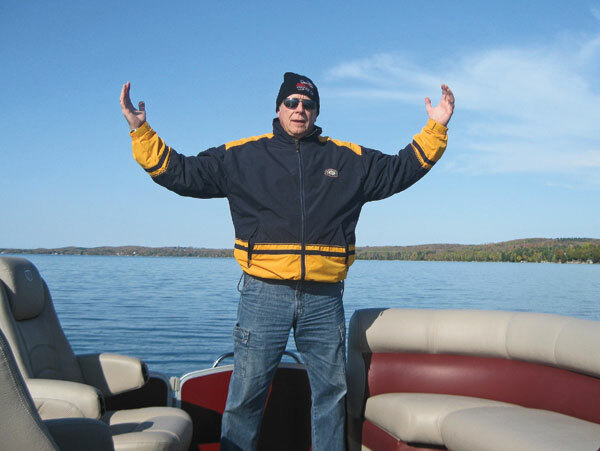 We love to cruise the different lakes here, such as Elk Lake, Lake Skegemog and Torch Lake, which are all connected. Our son, Ryan, and his wife, Kim, are really looking forward to cruising and skiing, then heading to The Dockside restaurant on the Clam River this summer. We custom-ordered our boat, so we got exactly the color combination and options we wanted, including a galvanized trailer in case we want to take it on the road to places such as nearby Traverse City or Charlevoix. LOA 23 ft. 5 in.